Four Japanese ghost stories — “Black Hair”, “The Woman in the Snow”, “Hoichi the Earless”, and “In a Cup of Tea” — showcase the importance of loyalty, honor, and fidelity. This most unusual Japanese horror import — directed by former art student Masaki Kobayashi, and based on a quartet of stories by Greek expatriate Lafcadio Hearn — is an unabashed aesthetic treat. Featuring other-worldly set designs and highly stylized, color-drenched cinematography, it immediately evokes a fable-like sensibility, transporting viewers to an alternate fairy-tale universe where morals are everything and one false step can result in eternal tragedy. 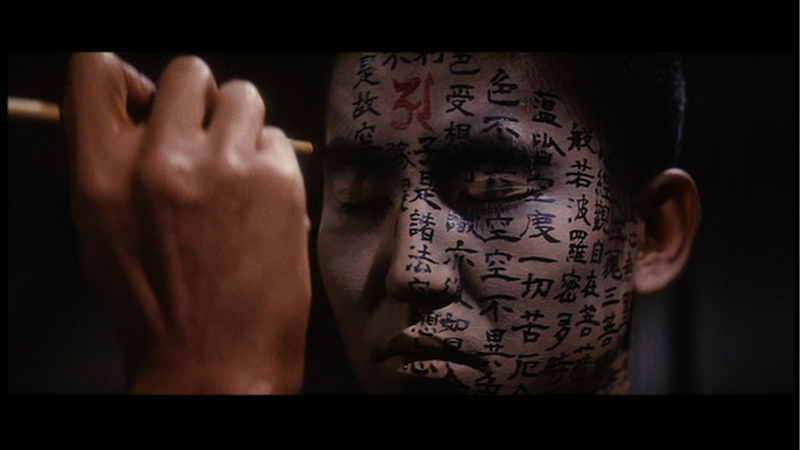 To that end, the “horror” element of Kwaidan is systemic rather than explicit: while there is some violence — one character has his ears sliced off in retribution — it’s never gratuitous. Ghosts appear as a matter of course, showing up simply to remind characters that the past is still very much alive, and that spirits are inevitably a part of current existence. Like most omnibus collections, certain stories in Kwaidan (the title translates roughly into “ghost story”) emerge as more successful than others. The first two episodes — “Black Hair” and “The Woman in the Snow” — are the shortest and most unassuming of the quartet, telling simple yet profound tales of husbands who in one way or another fail to live up to their marital duties; it’s especially gratifying to see the familiar face of Japanese cinema icon Tatsuya Nakadai in the latter. 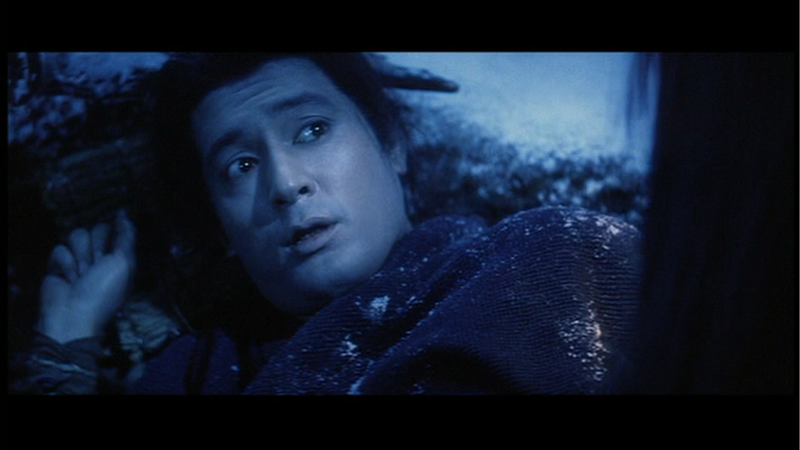 “Hoichi the Earless” is the most flamboyant and central tale of the film, spanning literally centuries: it opens with a stunningly stylized recreation of a samurai battle, then shifts to the impact the battle’s forlorn ghosts have upon a well-meaning priest (Katsuo Nakamura) whose life is put in danger — despite his best intentions — simply by “knowing” them; Nakamura’s likable, authentic performance buoys this rather depressing fable. 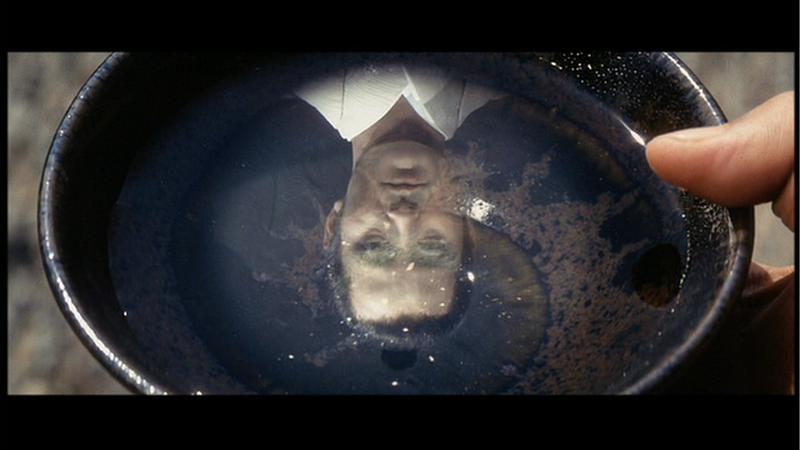 The final episode in the film — “In a Cup of Tea” — remains just as visually evocative as the others, but ultimately fails to engage on any deeper level. Taken together, however, Kwaidan provides a most unusual viewing experience, one which any film fanatic truly interested in witnessing the diversity of expression international cinema has to offer can’t really afford to miss. Yes, as a most unusual foreign gem. Listed as a film with Historical Importance in the back of Peary’s book. I believe I’ve now seen this at least three times: the first time (I think) because it is listed in Peary’s book; the second (probably years later) to give it, well, a second chance; the third just now so that it would be fresh in my mind. 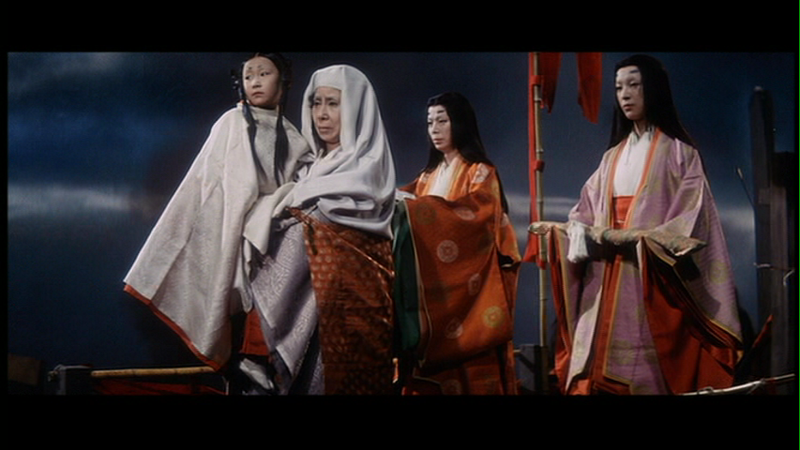 ‘Kwaidan’ also boasts a cast which includes many fine Japanese actors (several of whom often worked with Ozu, Kurosawa, and other top Japanese directors). Unfortunately, as they are all more or less trapped inside a ‘concept’ here, all of them are serving that concept and, as a result, none are at their best. 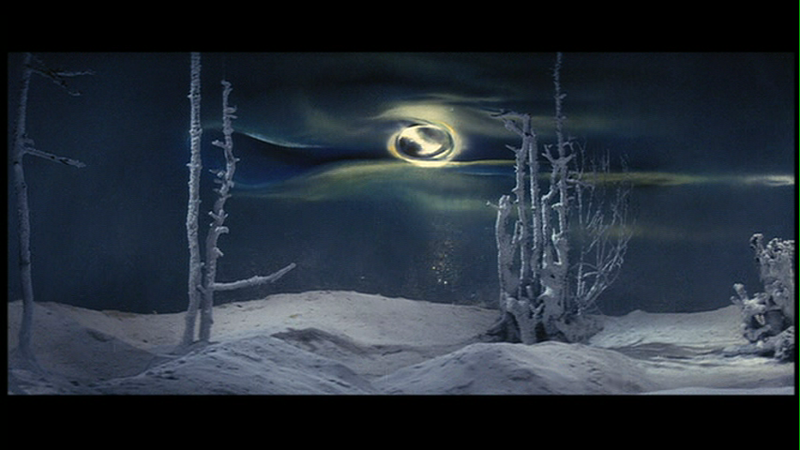 The root problem is the film’s deliberate, f-u-n-e-r-e-a-l pacing. Which, in itself, is not a bad thing. Many terrific films are slow-paced; on the other hand, such films generally have a higher purpose. 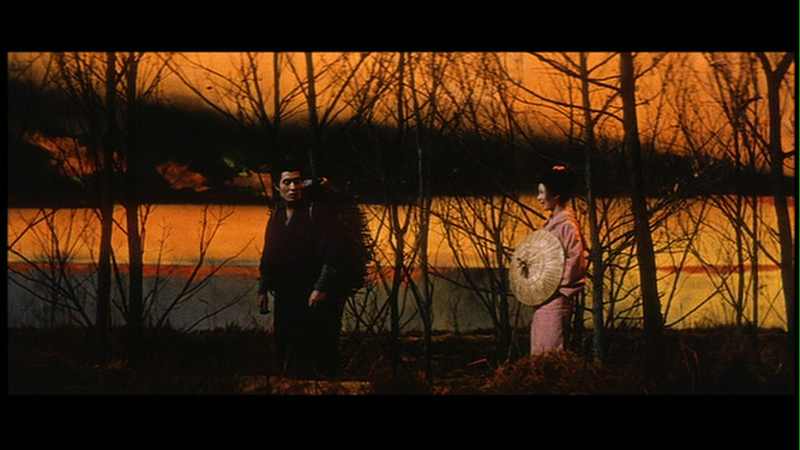 What makes ‘Kwaidan’ seem a lot slower is that it is basically one long riff on a theme; the details are slightly different but it’s a round of evil spirits wreaking havoc whether it’s deserved or not. The end result is a film that seems to chase its tail rather than build. 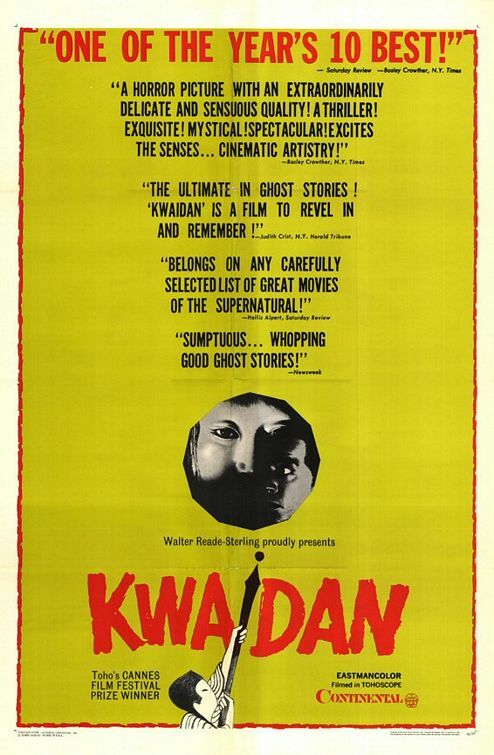 I know ‘Kwaidan’ is generally a much-respected film – and it won the Jury Prize at Cannes and all that. But I’m sorry, the movie leaves me drained, and without an accompanying sense of overall satisfaction. As well – and perhaps more to the point – as presented, these really aren’t very scary ghost stories.